He turned 1 (12 months) old yesterday. He is a big boy now. He was shipped to NYC from Oklahoma when he was only 2 months old. In the ten months we have been together, we developed a tight bond. He is my best buddy. He is beautiful, loving, playful and a lot of fun to have around. Even though I didn't have the opportunity to hand pick my puppy, I couldn't have asked for a better dog. I love my boy Rambo very much and I am looking forward to many happy years together. Hi there, Ileana. It is really good to hear from you all the way up in New York. Thanks so much for taking the time to come here and sharing your German Shepherd puppy Rambo with us all here today. I really love the picture too, thanks for including it so we can see your big boy. He looks as though just hanging out is okay but that he is just as ready to play a game of hide and seek or fetch the ball too! He is a very handsome young German Shepherd puppy. 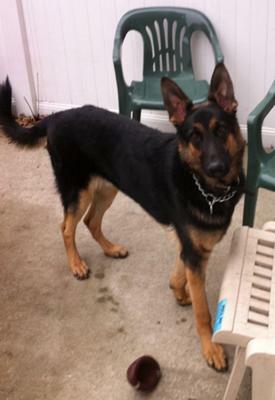 And he looks so much like my new GSD rescue puppy, Rodie. The likeness is unbelievable. They could be brothers they look so much alike! I really, really like the bicolor pattern on German Shepherds - I think it is just so striking and handsome. Rodie is my first bicolor German Shepherd.